To translate the user interface it is important to understand that the user interface is the set of elements that allow the user to interact with the AtoM application. These elements include the main menu, drop-down menus, context menus, title bars, column headers, button blocks, field labels, and other recurring elements that are used to navigate AtoM or to search for, view, add, modify, and delete database content. Start in your default language (e.g., English). Navigate to the language menu in the header bar and select the language you want to translate the user interface into. AtoM will reload the page with the translation bar at the bottom of the page. 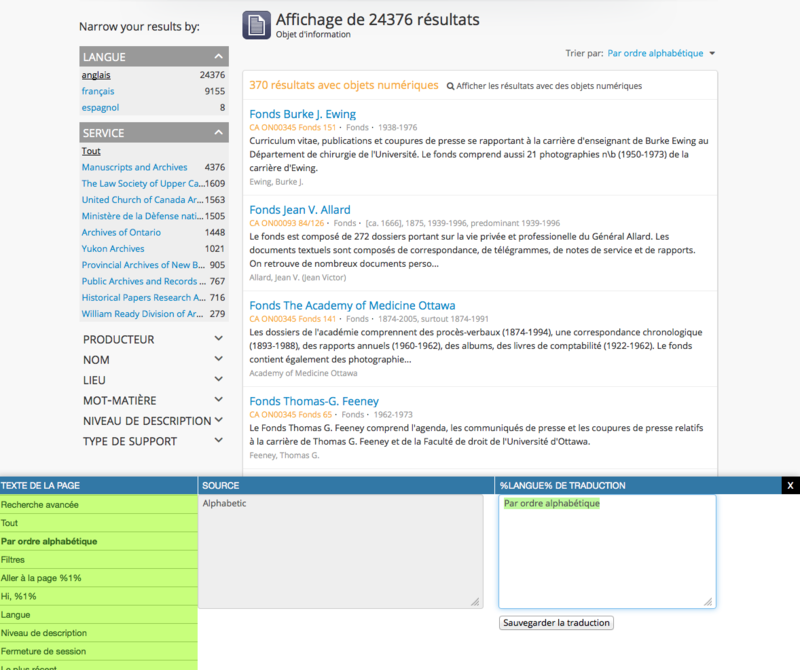 This example shows the translation bar in French. Click on the Translate User Interface button in the translation bar to open the translation panel in the lower frame of the page. First column: Page text lists all the elements that are translated, or available for translation. Second column: Source is the name of the element in the source language. In this example it is shown in English. Third Column: Translation shows the translated element, or it is empty and waiting for the user to type a translation into it. Select an element for translation from the first column. Provide the translation for the element in the third column. Click on the Save Translation button when you are finished. AtoM will close the translation panel. All user interface elements on the page should now appear as translated. Some element names include a number enclosed by percent sign (e.g., %1%). this is a template token indicating a variable whose value is dynamically generated by the context in which the termplate is displayed. Tokens are represented by a number enclosed in percent signs. Tokens must be included in the translation, but because different languages have different grammar rules, translators ned to be aware of the type of information being handled in any given variable in any given context.